I stumbled upon yet another "healthy" variation of Maggi nutri-licious noodles in the supermarket a few days back. I had earlier written about atta noodles and oats noodles and why they aren't healthy as the brand claims. Do check it out if you haven't. 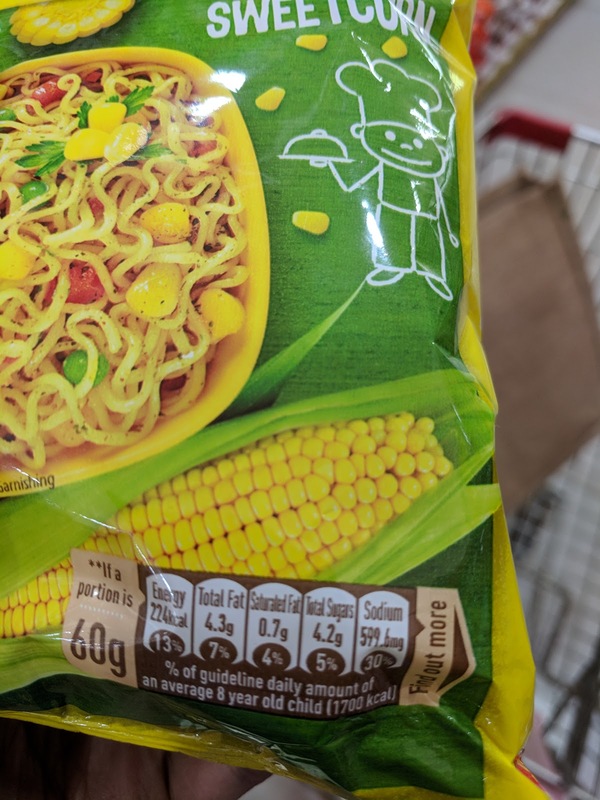 This new variation is called Maggi nutri-licious baked noodles with sweet corn. The target audience is clearly children looking at the image and the nutrition values are based on the RDA of a 8-year old child. This is the first time I'm seeing the nutrition facts based on a child's requirement. Though I'm happy about this change, the sodium % makes me question if the RDA values are correct. In a serving size of 60gm of baked noodles, the sodium quantity is 599.6mg. Do you see the Bata pricing tactic being employed here - 599.6mg? Why not call it out as 600mg? The guideline daily amount % shown is 30%. If 600mg of sodium is 30%, then it implies that an average 8 year old child's guideline daily amount of sodium is around 2000mg. I couldn't figure out the daily amount guidelines for sodium as recommended by National Institute of Nutrition (NIN), Hyderabad. Will try to reach out to them to see if there are India specific guidelines and update here if I get any answers. Meanwhile, using the data from American Heart Association (AHA), the recommended daily amount of sodium for 8+ year old kids and adults is 1500mg and the upper max limit is 2300mg. So irrespective of whether it is baked, fried, atta, oats, corn or the regular noodles, one cannot deny the fact that all such noodle variants are HIGH in sodium. The packaging imagery is filled with sweet corn kernels which is one of the favorite foods for most kids. 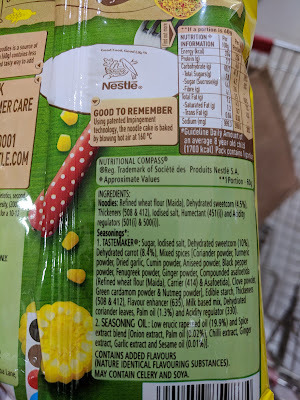 But if you look at the ingredients, the dehydrated sweet corn is ONLY 4.5%. What should be the maximum value of a particular ingredient if the brand intends to use it as part of their branding? A brand adds 10% quinoa and calls it quinoa chips. 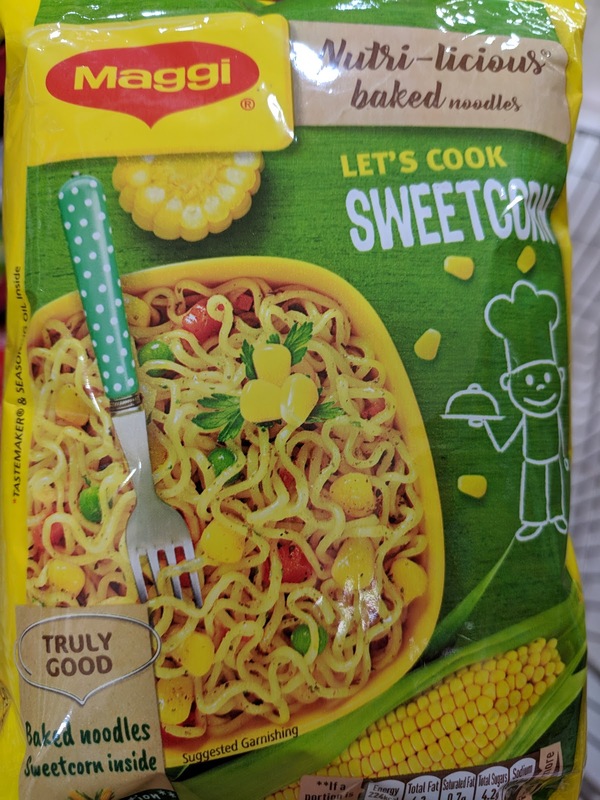 Another brand uses 4.5% sweet corn and calls it noodles with sweet corn.There's no such regulations/guidelines in our country and brands misuse it big time. Yes, the total fats are low compared to other variants, but the noodles cake is made with maida/refined wheat flour. Maida has no nutrition whatsoever, it spikes up the blood glucose levels which affects the pancreas in the long run. (4) Where's the protein and fibre? 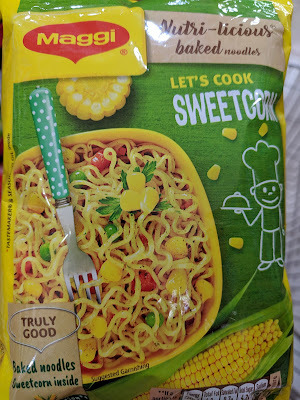 The brand mentions that this baked noodles is a source of protein and fibre in a child's diet. If you look at the nutrition facts, a single serving contains ONLY 4.6gm of protein and 2.5gm of fibre. Regular Maggi has slightly better protein and fibre, if you do a comparison. 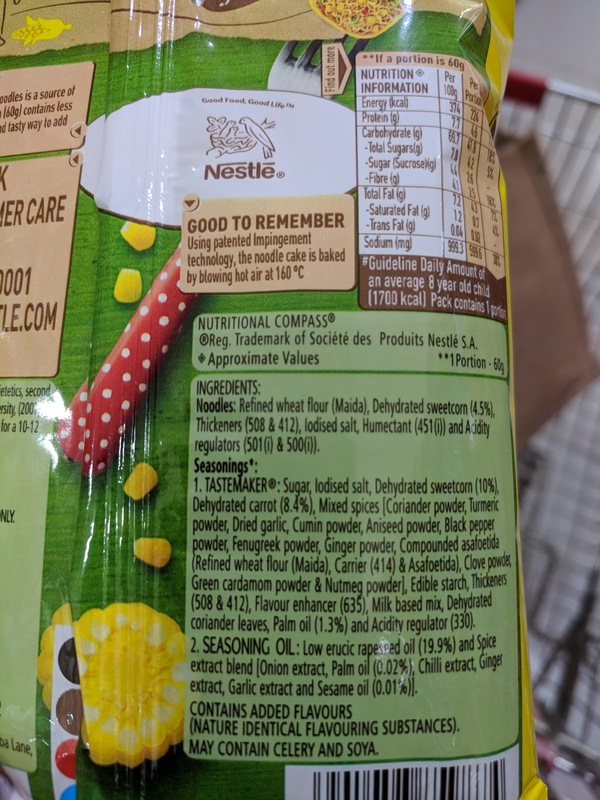 Though the noodles cake is baked, the tastemaker (masala pack) ingredients mostly remain the same, which includes flavor enhancer 635 - disodium ribonucleotides. I have written about this ingredient in my earlier post on Maggi Masala-ae-magic. 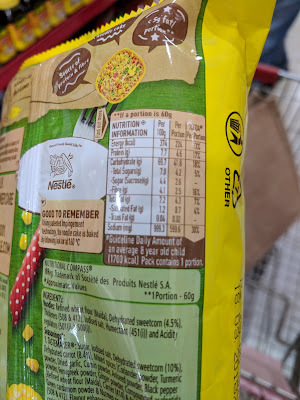 If you or your child crave Maggi, buy the regular variant once in a while. These supposedly "healthy" variants are a big sham and not worth consuming on a daily basis. What next? Quinoa variant? Ragi or any other millet variant? The same story will repeat itself. Add a teeny tiny percentage of these healthy grains, keep the rest of the ingredients same and position it as a healthy snack for kids/adults. This trend seems to be never ending, unless we as consumers stop falling for this trick.